Be an Expert! – Super Stone, Inc.
Not having proper training or knowledge on a product can be devastating to your business. 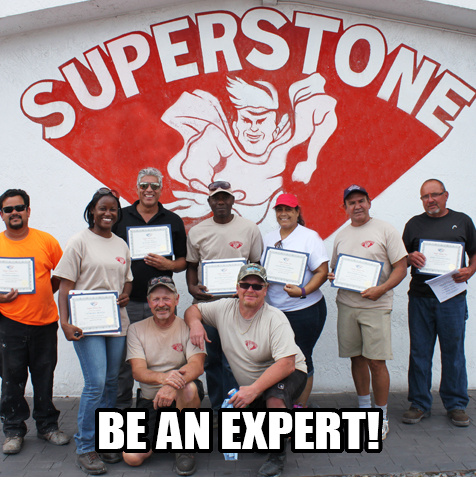 Super Stone® provides hands-on training seminars monthly where you can learn how to use our full line of products. In addition, you will get tips and tricks of the trade by veterans of the industry, marketing tips, and information on how to price out your projects. Not just anyone can do it! Many different trades require special knowledge for proper installation and application and decorative concrete is no exception. While a painter may have much knowledge of painting, applying decorative coatings is horse of a different color. There are many facets of concrete not found in any other trade. Having the experience and knowledge pertaining to moisture, density, and surface conditions of concrete are just some of the important aspects when applying decorative concrete coatings. In short, make sure you or the persons you have entrusted to apply decorative coatings have experience. With decorative concrete coatings and stain applications, doing things over can be costly and full of headaches. Get the training! Super Stone offers a two-day comprehensive training course. Learn important techniques and bid strategies that will serve as profitable and rewarding tools to increase your scope of options. Make samples, Show off what you know! While some may not view this as a mistake, it is good practice to create tangible samples for your customers. These samples can help alleviate discrepancies when the project is complete. Not only will your client see the results before you perform the work, you as the installer can interpret the design wishes of your customer and learn which colors and techniques will best achieve them.